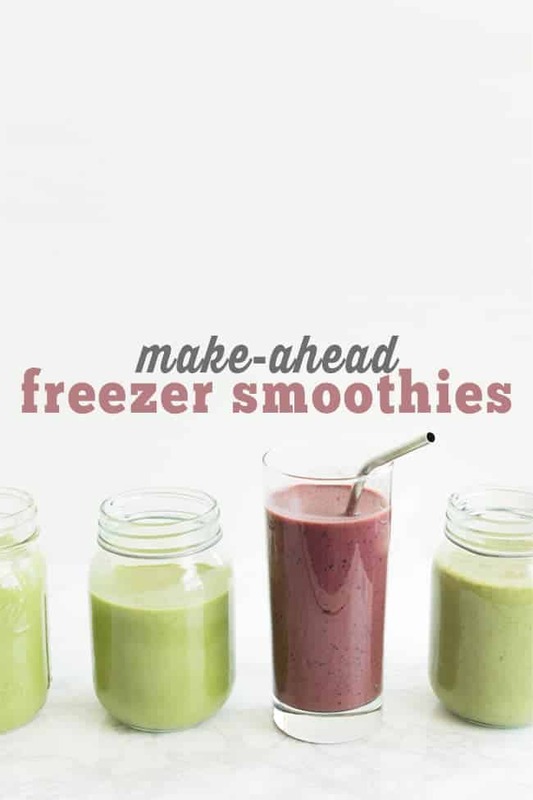 Make Ahead Freezer Smoothies are going to save you so much time while still keeping you healthy and on the go. Don’t forget to bookmark this in your browser for easy access later! Freezer smoothies. 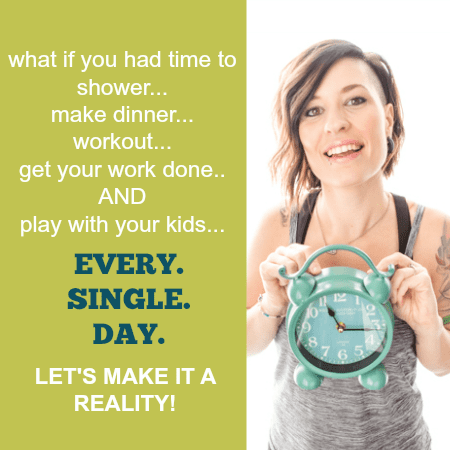 It’s a thing that you 100% need in your life, especially as the busy on-the-go mom that you are. Honestly, they’ve saved my life a time or two. But first of all, hi! I feel like it’s been 2 billion years since we last chatted. Life is insane. As I sit here typing away, I’m struggling with the fact that I can’t run my washing machine because my dishwasher is running. And my family has to coordinate shower time with other people using the bathroom. And you better not both try and brush your teeth at the same time because it’s just not gonna happen. Yup, something is wrong with our water pressure, and I’m about to lose my mind. 4 loads of laundry need to be done in the next 2 days. I have 4 recipes to make, creating lots of dishes. Plus there’s normal dishes that happen throughout the day. Oh, and yeah, we should probably take care of our general hygiene as well. To say I’m overwhelmed is an understatement. So do I have time to make healthy snacks for my family this week? That’s a hard no. Do I have time to make a fresh smoothie for me smack dab in the middle of the day? Probably not. But let me tell you what I can do. I CAN make a smoothie right before bed for the next day. 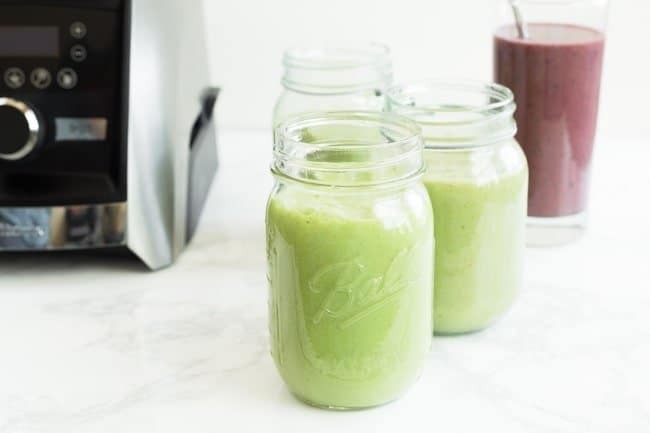 Thankfully, my partnership with Vitamix has made my life just a little bit easier with the help of their innovative tools – as always, all opinions are mine and are 100% honest. 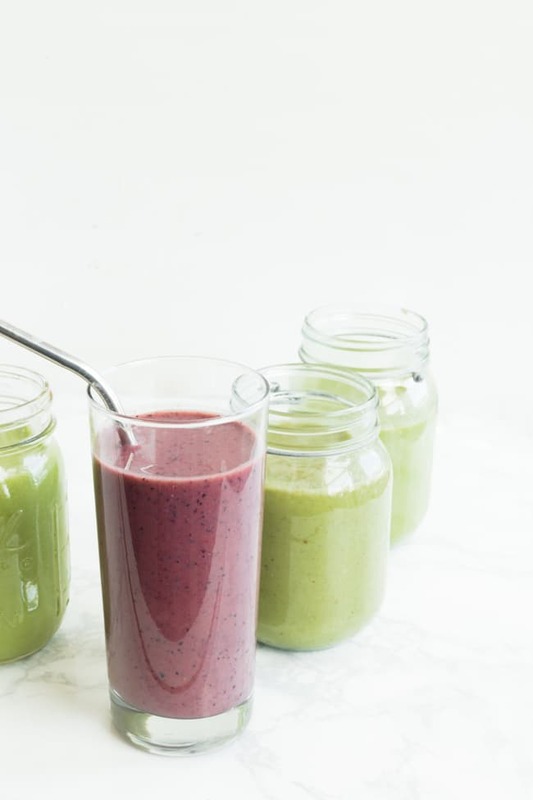 I know what you’re thinking – an overnight smoothie is gonna taste gross by the next day. It won’t be mixed properly. The flavor will change. It’ll all be wrong. I had those same thoughts. But then I was determined to figure it out. There’s got to be a way I can make a smoothie ahead of time right before bed for the next day. On top of that, I also wanted to have a smoothie ready for when my son got home from school. But again, no time. I popped all the smoothie ingredients into my Vitamix Ascent cup, twisted on the blade, blended it all up RIGHT IN THE CUP…. you guys!!! Once it was all ready to go, I put on the spill-proof lid, placed it in the freezer, and went to bed. In the morning, I took it out the freezer. I put one cup in the fridge for me, and one in my kiddo’s backpack so he could start on it right after school before even getting home! Note that it does take about 6-7 hours to completely defrost, depending if you have it in a backpack/lunchbox or if it’s in a fridge. Just give it a good shake and you’re ready to go! 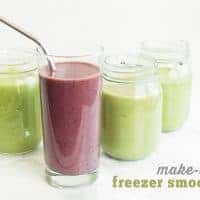 Here, let me show you exactly how these Make-Ahead Freezer Smoothies work in action! 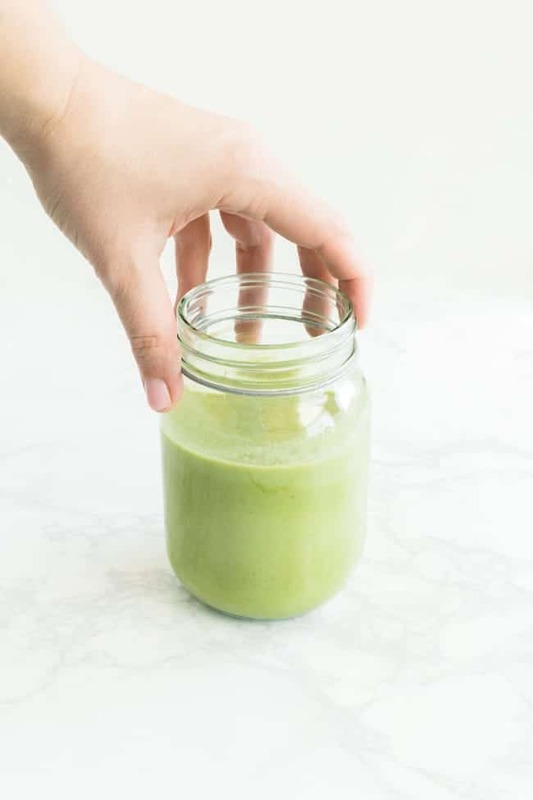 Blend all ingredients together in blender jar, preferably a high speed blender. Freeze overnight in a freezer-safe container. Remove from freezer to thaw at least 6-7 hours before you are planning to drink it. Give it a good shake once thawed and enjoy! Place ingredients in jar in the order listed if you're using a Vitamix jar. Otherwise, in a regular blender, reverse the order. 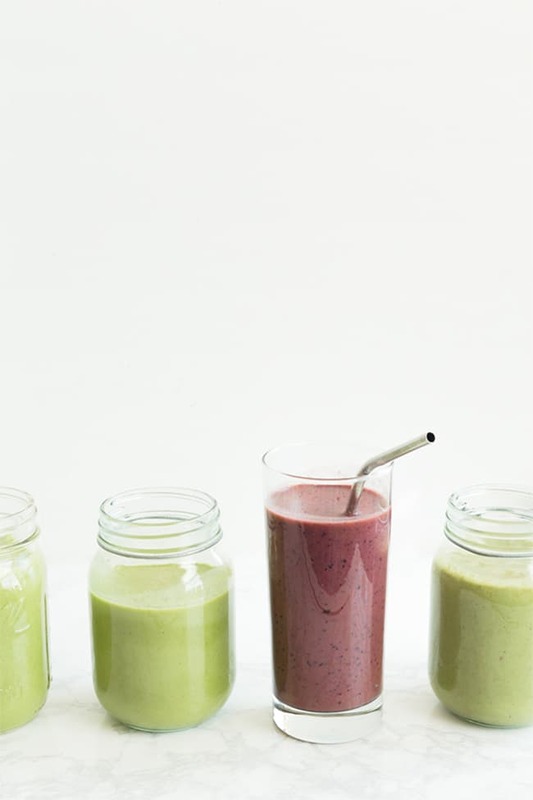 No need to freeze any ingredients before hand if you will be freezing the smoothies overnight. All smoothies are GREEN smoothies except for the berry blast, which is a purple hue. Thanks for sharing! I do notice that when I freeze smoothies, I get a freezer burn on the top layer… Do you have any tips on how to get prevent that? Hi Alice! I actually only freeze for about a day or two, not giving it enough time to form a freezer burn. And I’m always sure to use a freezer safe air-tight container, not letting any air in. Good luck! I was told by a Vitamix rep that I should not put my Vitamix container in the fridge, let alone the freezer, because it compromises the seal around the blade. I don’t have an Ascent container, but wouldn’t it be harmful for it as well? Hi Meeka! Yes, the blender jars with the blades attached should not go in the freezer. But these single-serve jars have a detached blade/motor that you’d take off before freezing. 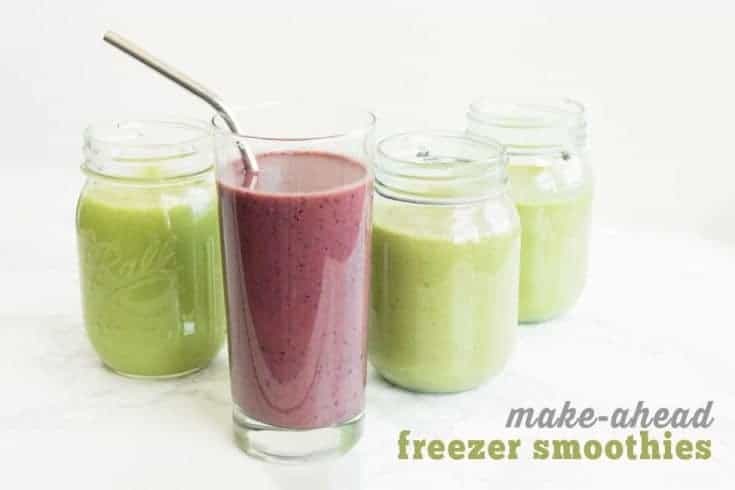 Of course, you could always just pour the smoothie into a freezer-safe jar of your choice for similar results. Enjoy! Hi! I love your ideas. Thanks much! But I must tell you that about a year ago I called the Vitamix company to find out exactly which order to put the ingredients into the blender. And their advice was not the same as what you wrote. They said to put the liquid into the Vitamix container first, followed by the banana and anything else that is very soft. After that comes the harder fresh fruit, grains, etc. Then, FINISH with the greens, (If ice is used, it always is the last ingredient to go into the container.) In other words, start with the juiciest/softest ingredient(s) and then follow through with harder-and-harder, denser-and-denser ingredients, Do you have any idea why their suggested order of ingredients was different from yours? It is because when you flip the single serve containers, the order is then of course reversed. Yes! I know exactly what you mean. Making the night before can sound really gross with the idea of letting it sit, but it’s really not. Also, just FYI, I’ve made smoothies up to a day before and made sure to keep in a glass air-tight container in the fridge without freezing and it tastes just as fresh as if I’d just made it. Good luck! I bet your husband will love this!